A social media site for divers has asked the question ‘How many dives do you need to make before you can call yourself an experienced diver?” It was combined with an online poll. The consensus seems to be that the 100th dive is the important milestone. I disagree. After diving full-time at dive sites around the world, from Norway at its coldest to many tropical sites, with plenty of temperate sites in between, I count that I’ve made more than 350 dive trips in a little over two decades. I don’t consider myself ‘experienced’. Every time I have stood at the aft deck of a boat, about to enter the water, I considered what I was doing with a certain amount of trepidation. That’s because nobody knows what it’s going to be like until you’ve finished the dive and safely climbed out of the water. I’ve picked my way up a reef wall in a strong current near Rinca Island, using my reef hook to counteract the fact that I lost my integrated weights when I discovered they could easily fall out of the BC I was using. I’ve walked across the seabed in Raja Ampat to a nearby island when the corrugated hose of another BC I was reviewing parted company. I had another BC in PNG with a dump valve that would not stay closed when at depth because its internal spring was not strong enough. That involved a lot of hard swimming upwards. I’ve been so busy filming sharks at Sha’ab Rumi that I mismanaged my air supply so that I had insufficient to do the mandated deco stops. I a note passed to another diver, which saw a second tank sent back down to me. I’ve had the front diaphragm of a new regulator collapse inwards (it had been taken apart and reassembled incorrectly by the previous magazine reviewer) while feeding sharks with Michelle Cove in blue water – making it impossible to breathe from. (That’s when I became less enamoured of those combined direct-feed and alternate air supplies. I’ve lost my way inside the wreck of the Umbria during a night dive in Port Sudan. I’ve waited several hours to be picked up after my boat broke down at Dahrat Abid. I’ve had the direct-feed of my Viking drysuit stick open during a wreck dive in the English Channel. I’ve been grabbed by a large tiger shark, which I’d taken my eyes off, and swum off with more than one in the Bahamas. I’ve done a dive at the wrong set-point on an early rebreather at Cocos Island, and had to then recompress myself at a high set-point in the water. I’ve put the scrubber the wrong way round in another early rebreather and given myself CO2 poisoning too. I’ve swum in the wrong direction, following the line, after stopping to take pictures deep inside a Bahamas Blue Hole. I’ve had a drysuit neck seal fail while wearing an electrically heated vest in a British flooded quarry. I’ve fallen out of the speeding dive boat that I was driving in the Mediterranean. (I’ll always be sure to have the engine cut-out lead attached to me in future.) I’ve plunged downwards head-first to the sandy seabed in Malta because the borrowed rebreather I was using had a weight array fixed along its top edge. That might have suited its shorter owner but, in a drysuit, my long legs meant that air migrated to my legs. It was impossible to sort the problem and I did the whole dive inverted yet still managed to get the photographs I’d been sent to get. It had a side-mount BC become unattached and invert above my head at the Elphinstone in the Red Sea. It was impossible to dump air from until I’d sorted it out, which I had to do to avoid an uncontrolled fast trip to the surface. The list goes on. I won’t even bother to list the disasters I’ve sorted out that others had involved themselves in. Let’s just say I’ve had real practise with controlled buoyant lifts and CPR. Doing 100 dives in benign conditions might lead you into a false sense of security. You could think that I am experienced over several thousand dives but some of those experiences have been less than good. What doesn’t kill you makes you stronger – so they say. The majority of my dives have been undertaken without serious event. 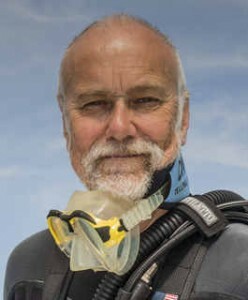 I would never boast I was an experienced diver – but I’ve survived a few diving catastrophes, some of which were my own making, by keeping control and thinking my way out of the problem. I’ve been in professional diving for nearly 48 years now including founding TDI/SDi and serving as Chairman of the Board of NAUI. I think a good basic parameter of “experience” to allow skill development and practical knowledge to come forward would be about 100 dives in a variety of diving environments. Every dive is a learning experience with confidence and competence growing with every submersion. Certainly, handing new divers a card that says they’re “Advanced Open Water Divers” with only a total of nine dives in their lives is ridiculous and you can thank PADI for that. If you want to keep people in the sport, expand practical training and keep your customers diving after certification. Divers need exposure to beach dives, currents, droffoff walls, wrecks, marine life, boat diving, night dives, etc. The goal is for our students to reach a plateau of independent diving… actual experience is the path… not collecting a bunch of meaningless certifications and patches to sew on your jacket. By the way, I managed around 7000 dives without any kit problems. I also have several thousand dives and struggle to remember anything so scary happening, like your list. So I have to agree with Chris on this. Perhaps it’s time for you to re evaluate your diving style. Absolutely consider mastering new equipment on an easy dive or confined water site! If a diver who has 100 dives does this, he / she is a smarter diver than you and therefore, in this context, “experience” is irrelevant. I know who I’d be picking for a buddy…. sorry. It used to the case that in order to pass a dive course, it was much important thst the student was able to stay calm in addressing unexpected issues than doing a thru z on a check list. I don’t think that the number of dives under your belt really doesn’t mean very much. This is especially true if divers just follow the lead of others and don’t think for themselves. Experience in dealing with all kinds of different circumstances is much more important. Be prepared, be aware of your surroundings and know your gear as well as your limitations. As someone who has been doing this a while, I’m amazed that you feel that testing new equipment is something you should be doing on challenging dives. That you have had so many issues with kit that you decided to dive without having tested, weighted, in pool, confined water reflects more on your approach than to anything else. Gaining experience by not learning from one’s own mistakes is not so much the mark of an “experienced diver” as it is something else altogether. You need to get yourself on a Human factors in diving Course”, google it if not familiar. I would consider myself experienced at 1 dive site with my exact current set up…..because that combination has been done over 200 times. As soon as ANYTHING changes….nope not experienced at all….but prepared.